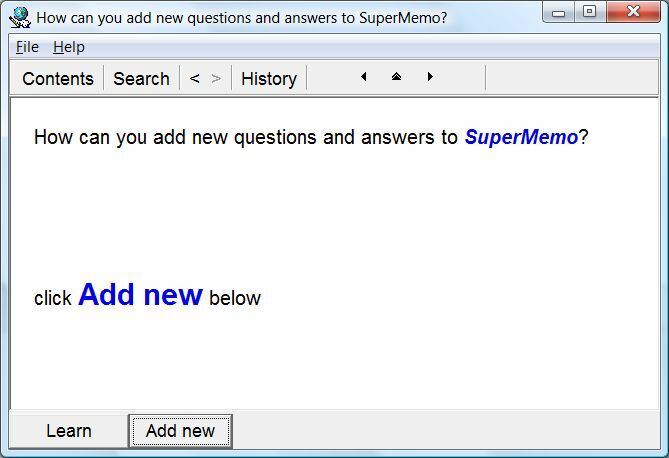 SuperMemo will help you learn faster! It is enough that you now spend 3 minutes reading this page to be able to begin learning! Start learning now! Initially you may doubt the power of SuperMemo. Trust it for 1-2 weeks and you will begin to understand it better. Add at least 50-100 questions-answer pairs related to your job, your life, or your interests. See how SuperMemo schedules the material for review. Important! Learn will only ask you to review your material after a few days. For that reason, spend your first days on adding new material for learning. Backup copy - to make sure you never lose your learning investment, you must learn how to back up your learning material!